In coaching we often need to share files. File resources for your clients can take all kinds of shapes: e-books, images, slides, videos, audio clips. In the course of a coaching engagement, your style may call for sharing such files. The most obvious and basic way to do this is to email ’em on over as an attachment. From that simple baseline, let’s look at how CoachAccountable can do you a few better. CoachAccountable file sharing works by either coach or client uploading a file, and the other party securely accessing it with a single click. How does this improve upon email attachments? First, mobility. You might use web-based email (meaning your attachments are available wherever you are), but your clients might not. CoachAccountable file sharing is inherently web-based, meaning you and your clients can always access shared files with an internet connection. Second, accommodating large files. Audio and video tend to be in the 10’s of MB or more. Most email providers still have a cap on how large a file you can send, making emailing impossible for most substantive audio and video. While we’re on the subject of file size, large files sitting in your inbox use up valuable disk quota in web-based email systems, which might affect you and/or your clients (i.e. a video might take up 20MB in your account as the sender, and 20MB in your client’s account as the receiver). With CoachAccountable, you can even embed video and audio files so they play right in the app. Third, sharing the same file with multiple people. Perhaps your coaching style entails one or more file resources that you share with everyone you coach. 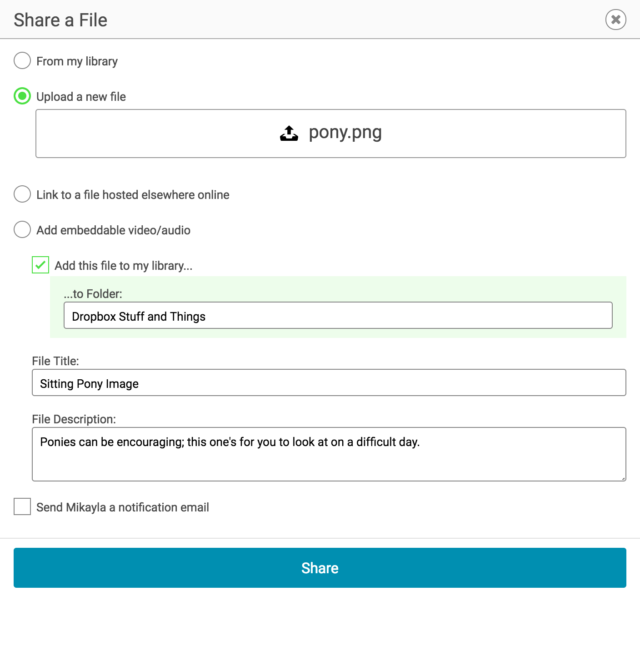 With CoachAccountable you upload files once to your library, and with a few clicks share them with clients as called for. If you have 30 people that you’re coaching and your program calls for them all to watch the same video, it is much nicer to upload it just one time to your library, and share it with all 30. You can also share multiple files with multiple people at once, or share with a group. Forth, secured private access. This is no different from the email route, but a nice benefit over other ways of sharing files like putting them on a website. Without a lot of hassle, files shared in CoachAccountable are accessible only to authorized parties. Fifth, awareness. CoachAccountable tracks if and when your client accesses the files you share with them, giving you a little window into how well they’re keeping up with the materials. Sixth, comment threads. When you share a file, there might be a little back-and-forth about it, dialog like the one below. Commenting on a shared file is as simple as replying to the email notification, and CoachAccountable files this all in context in the coaching stream which makes it easy to review later. 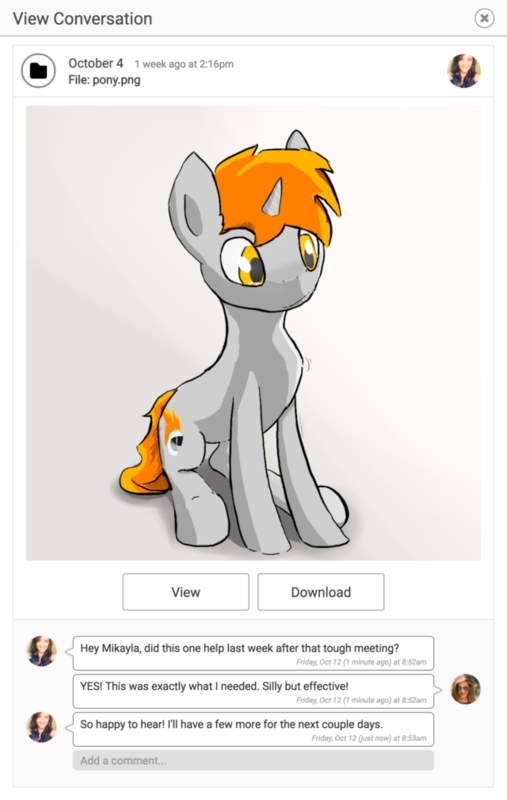 Who knew a pony could be so effective for coaching? 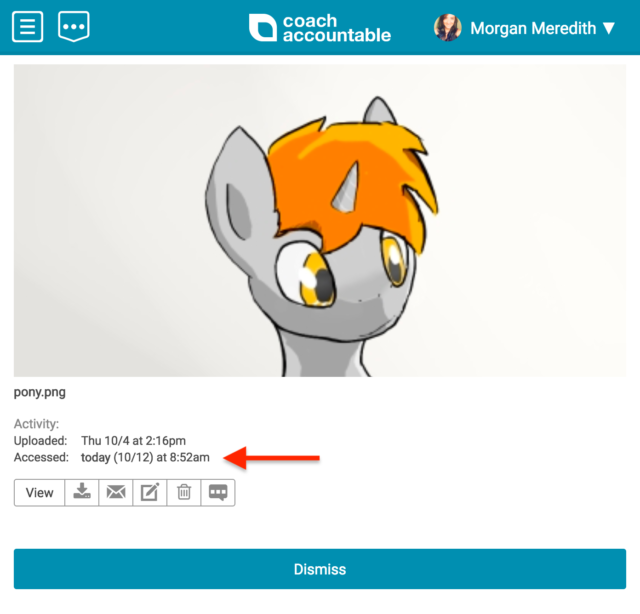 File sharing online is nothing revolutionary, but CoachAccountable provides a few ways to make it a little nicer and a little easier. Best of all, it fosters dialog between you and your client, allowing you to better know where they’re at and offer timely support. Just a few more wins you can get when you use specialized coaching software.